Encounters have consequences. Every slain bandit has friends who want revenge, and every devil banished back to the Eleven Hells reports its failure to its Dark Lord. What happens when the PCs’ daring deeds come back to bite them? The Gear District of Zobeck is home to both the city’s most industrious minds and its most repulsive working conditions. Many gearforged purchase their bodies at enormous expense and are forced to work, slave-like, to pay off their debt. Many are forced to turn to crime, not because they are evil, but because their bodies will be repossessed if they can’t pay up. The number of gearforged that appear depends on the level of the party. If the PCs are 1st level, they face a one thug per PC. At 2nd level, increase that number by 2. At 3rd, they face one thug per PC, led by 1 veteran. They are in a 20-foot-wide thoroughfare, empty of civilians. Shady alleyways branch off of the main road every 20 feet or so. The gearforged with the flickering eye is a foundry worker named Winker; he flees if reduced to half hit points or once two other gearforged are reduced to 0 hit points. Developments. If the PCs claim victory, advance to Encounter 2. If the PCs are defeated, they are left unconscious (and dying) and may be revived in Encounter 2, but robbed of all their gold. If combat is averted entirely, it’s time to improvise! The sound of combat attracts the local constabulary. A group of clockwork watchmen (Tome of Beasts) rush in, blowing whistles and waving their truncheons. The artificial watchmen are well meaning but prone to obvious misunderstandings… for instance, assuming that a group of well-armed PCs standing over a group of destroyed or disabled gearforged civilians are the perps and must be arrested. They do not listen to reason and use net cannons to trap enemies before attacking with halberds from a safe range. If the PCs are unconscious and dying, each watchman has a potion of healing that they use to revive them. They then attempt to arrest them for public violence anyway. The number of watchmen that appear depends on the level of the party. 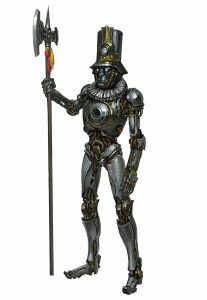 If the PCs are 1st level, they face one clockwork watchman for each PC, minus 1. At 2nd level, increase that number by 1. At 3rd, they face one clockwork watchmen per PC with one clockwork hound (Tome of Beasts). Developments. If the PCs beat the watchmen, advance to Encounter 3 as they leave the scene. If the PCs surrender quietly, they are put in shackles and advance to Encounter 3 as they are escorted back to the precinct. If the PCs are subdued, they wake up in a cell a few hours later and are quickly released if they admit they were attacked by gearforged, and Encounter 3 happens at a later time. 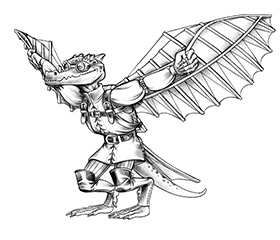 Winker, the gearforged with the flickering eye, is furious that his robbery didn’t succeed. His chassis will be repossessed if he can’t pay this week. After fleeing, he keeps watch on the PCs from balconies and rooftops, tracking them after their run-in with the constabulary. He attacks alone, unable to gather reinforcements, perhaps as they leave the Gear District or when they are resting back at the inn. Depending on the PCs’ level, Winker varies in strength. If the PCs are 1st or 2nd level, Winker is a gearforged thug. If they are 3rd level, Winker is a gearforged veteran. Developments. The PCs are likely to overwhelm a lone attacker. If they are sympathetic to his plight, they may gain a contact and ally in the sweatshops of the Gear District. If Winker manages to isolate and eliminate one PC, he may gain dangerous enemies, forcing him to seek out more sinister allies to protect him from the vengeful PCs.